Dimensions 0.25 by 9.50 by 12.50 in. Dinosaurs; Models; History; 19th century; Juvenile literature. Modelmakers; Great Britain; Biography; Juvenile literature. Night on Fire | Paper Wishes | Blue Birds | The Houdini Box | Crenshaw | Dear Mr. Henshaw | The Boy of a Thousand Faces | Small as an Elephant | Pop! Can you fathom a time when almost no one in the world knew what a dinosaur looked like? That was true in the mid-nineteenth century, until Victorian artist Waterhouse Hawkins built the first life-size models of dinosaurs, first in his native England and later in New York City, and dazzled the world with his awe-inspiring creations. With impeccable attention to detail, Barbara Kerley unearths a story of consuming passion, triumph, loss, and courage--and ultimately, of an extraordinary legacy that lives on today. Caldecott Medalist Brian Selznick celebrates this complex and fascinating individual through luminous, soul-stirring paintings that form a visual masterpiece. 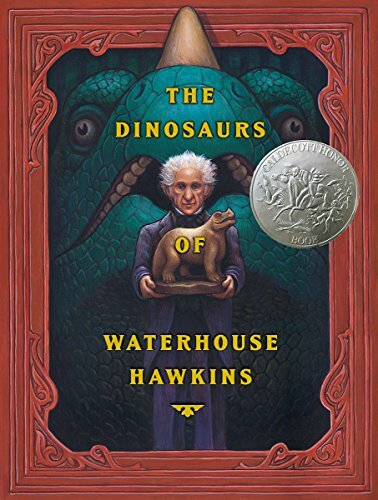 About: The true story of Victorian artist Benjamin Waterhouse Hawkins, who built life-sized models of dinosaurs in the hope of educating the world about these awe-inspiring ancient animals and what they were like.